Nebras Power Investment Management B.V., a Dutch affiliate of Nebras Q.S.C. ("Nebras") has signed a binding agreement to acquire 75% equity stake in Zon Exploitatie Nederland Holding B.V. ("ZEN"), a leading developer and operator of solar power generation assets in the Netherlands. The acquisition provides Nebras with access to the attractive and fast-growing Netherlands renewable power market and is in line with Nebras' stated objectives of establishing itself as a leading international power developer. ZEN currently has 96MW of solar capacity in operation, under construction or ready for construction and intends to grow further, taking advantage of the supportive policy of the Netherlands government. ZEN joins the growing portfolio of Nebras assets spread from Europe to the Middle East and South East Asia. 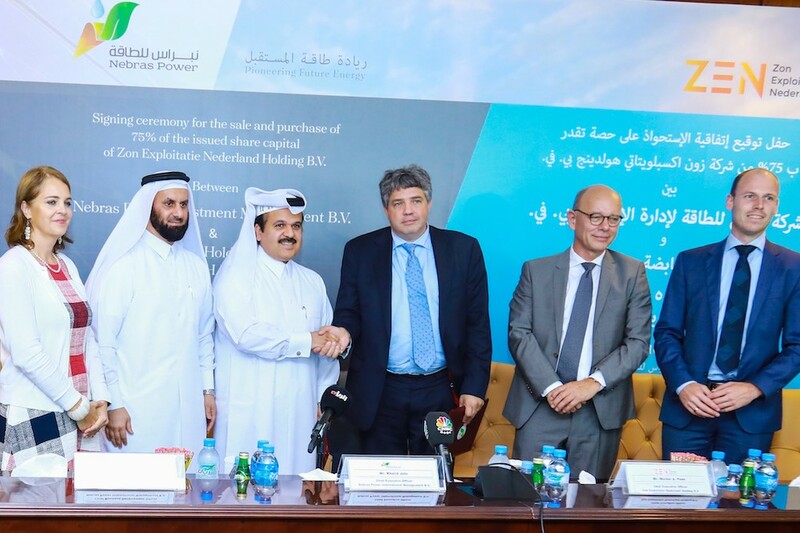 Commenting on the agreement, Mr. Fahad Hamad Al-Mohannadi, Chairman of the Board of Nebras said: "The acquisition by our Dutch affiliate of a controlling stake in ZEN is the first step in the direction which we have planned since the very inception of Nebras 4 years ago. The intent was and is for Nebras to become a grass-root international power developer. ZEN transaction will confirm this strategy and at the same time provide diversity to our portfolio." Mr. Khalid Mohammed Jolo, Chief Executive Officer of Nebras, further stated: "We are very pleased with this acquisition, which adds to our existing solar portfolio: the largest operating solar IPP in Jordan, Shams Maan, and AM Solar, under construction. We will continue building our international presence and forming partnerships with local operators with whom we can achieve rapid growth. We were happy to support our Netherlands affiliate in executing this transaction for Nebras." "The agreement signed today brings ZEN to a completely new level as a developer, EPC contractor, and operator and will support the deployment of an ambitious growth strategy in solar energy projects in the Netherlands to become a European market leader. We are proud of this leap forward in our performance and the strength of partnership that exists between Nebras and ZEN," said Michel Peek, Chief Executive Officer of Zon Exploitatie Nederland Holding B.V. (ZEN). Commenting on the deal, Mr. Faisal Al Siddiqi, Business Development Director of Nebras said, "We look at ZEN primarily as an excellent new business development opportunity, building on an already sizable base, in a rapidly growing market. ZEN will provides to Nebras access to its local development team, local knowhow and deal pipeline."